I love teaching. I love my students. Every one of them! Even the ones I hate, I love! It’s a burden, but it’s true. Each year, it’s a sense of loss I feel when I say goodbye to my class; and each year, I feel am losing a very important part of me! I have a theory you see: I am positive that students can sense when they are loved. They respond to that, and the outcome is always amazing! You feel the sense of accomplishment and triumph each time you play even the tiniest role in modeling a student’s mind and personality, because you know that even as the student is growing up and forgetting about you, he still has that part you gave him, that part of you. 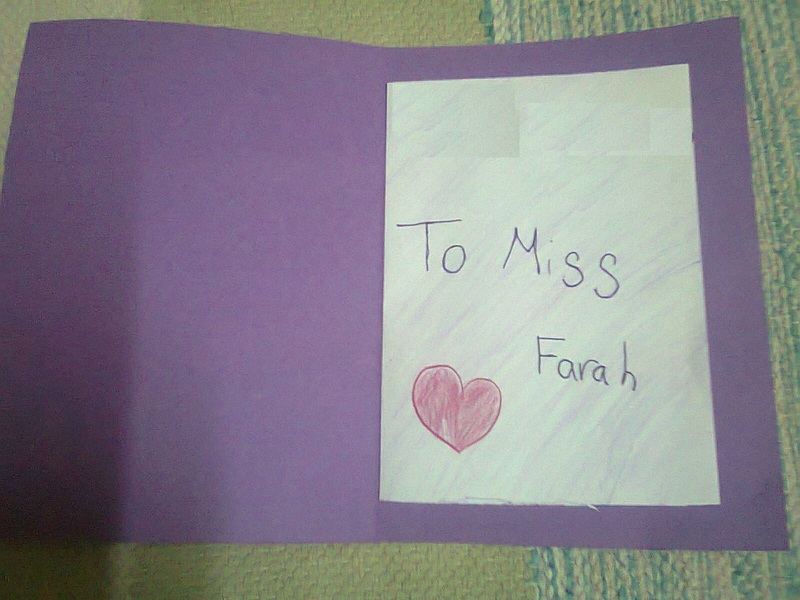 The note from a grade 5 student, was so sweet it almost made me cry (well my eyes did water up a bit!). 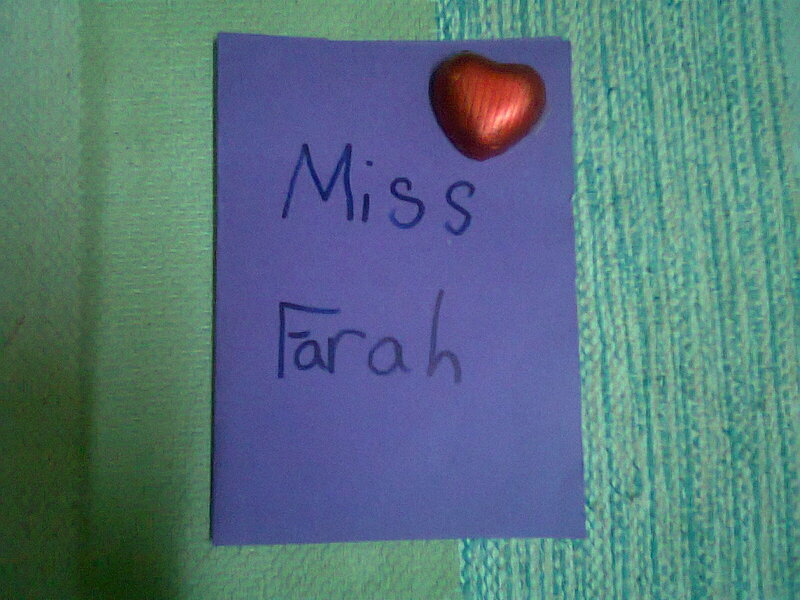 He sweetly explained to me how much he loves me, using the terms he had learned in class this year. Another made me laugh hard (it still does) because it was from a student in grade 8 (unusual I know) who tried to be a poet and said that joy enters his class whenever I did!!! There’s that girl who wrote me a not saying she loves me as her mother and it feels great! even though she would grow and forget, even though she will not remember my name: I touched her soul! A card and a small gesture meant the world to me and it came from two people I didn’t even teach!! I am grateful, proud and happy. I am satisfied. I must have been doing something right to deserve this and it feels great! Today was a great day at school. It’s the one day of the year when we take the time to celebrate being teachers, enjoying its rewards and basking in the warmth of gratitude.. This is actually the point: to feel cherished for everything you do, to feel valued and loved..
Today, I remembered all this when it was my turn to receive the gifts.. I felt saddened that no one takes the time to choose the gift anymore.. the gifts were all lovely, but so impersonal, so… Cold! 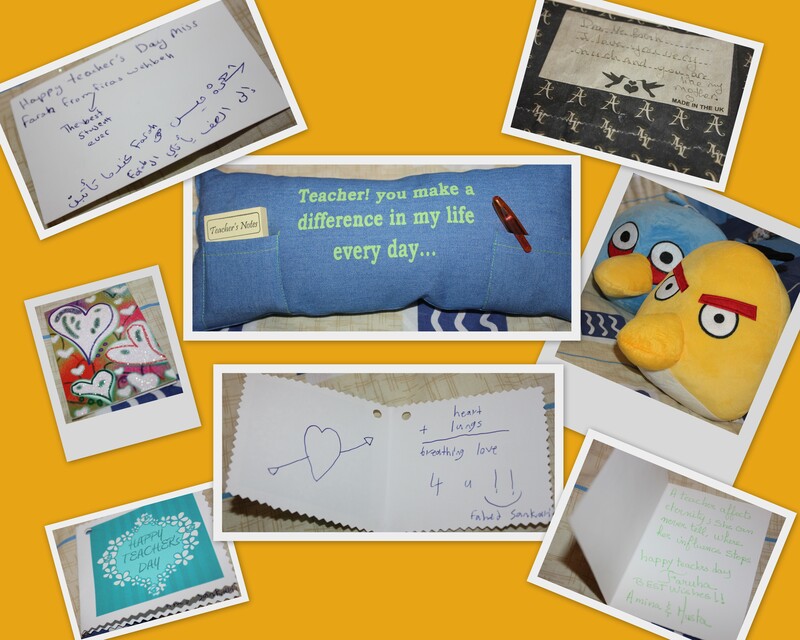 A grade six student personalized all his gifts: to each teacher, he chose what he knows she or he would like.. He gave me a necklace because he noticed I like to wear them, gave his English teacher earrings because she likes them.. He even chose a copper oriental vase for his history teacher! But the greatest gifts any teacher would receive are heartfelt, honest words that can fill your heart with joy ( and your eyes with tears). 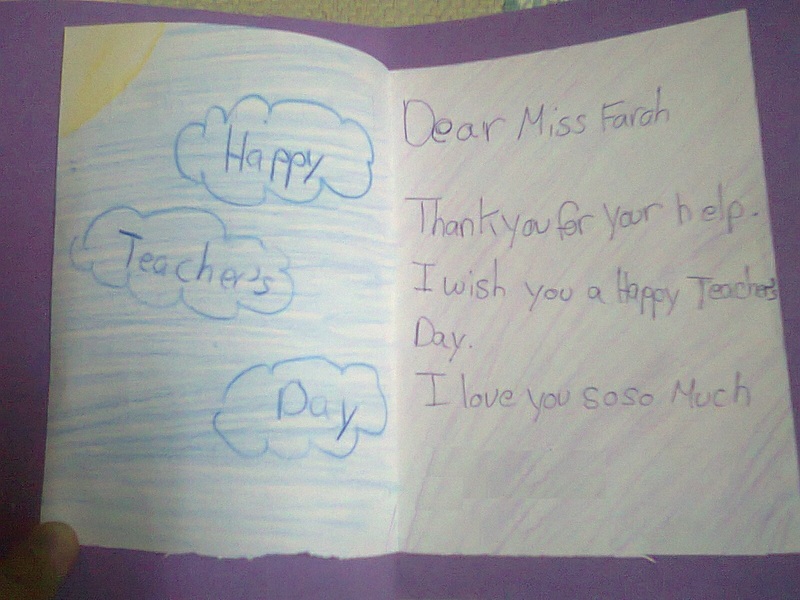 A grade five student, a lovely girl who’s new to the school, bought me a gift like her friends, but did not forget to add her personal touch: a sweet handmade card. These things do affect us teachers, the words, the love, the appreciation.. It truly makes our day! Sometimes, a sweet word is all it takes!